Tracksounds: Win THE TWO TOWERS THE COMPLETE RECORDINGS! Win THE TWO TOWERS THE COMPLETE RECORDINGS! For the last caption contest of the year, we have a whopper of a prize! 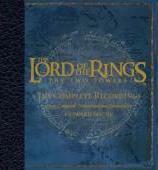 Enter this month’s contest for a chance to win a copy of the soundtrack "The Lord of the Rings: The Two Towers - The Complete Recordings" by Howard Shore from Reprise Records.